PHOTO BY JILL GOSCHE TU's Kristen Massey (12) applies defensive pressure to Indianapolis' Claire Carlton during the game in Tiffin Wednesday. Tiffin University women’s coach Jason Mishler doesn’t try to hide it.His team, playing its second game of the season Wednesday, likes the 3. The Dragons shot a paltry 6 of 27 from deep, and didn’t win. 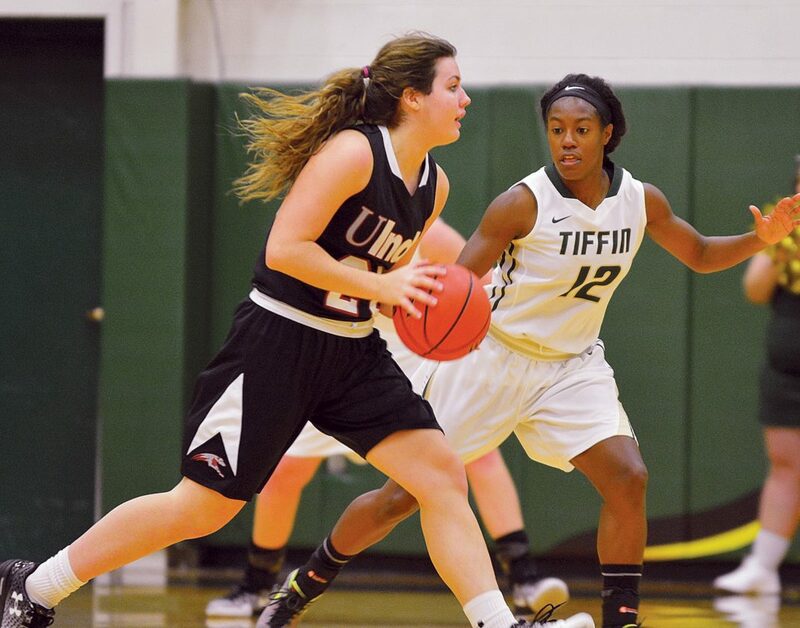 They were beaten by Indianapolis, 67-55.Tiffin fell to 0-2. It will return to action tonight, when it hosts Cedarville.While its 3-point shot wasn’t falling, Tiffin was able to stay in the game, despite digging an early 10-0 hole. It led 13-12 after one and trailed just 29-25 at the break. But the Dragons just couldn’t contain Indianapolis’ combo of forward Nicole Anderson and guard Martha Burse. Burse, especially, was fantastic. She finished with 22 points and 11 rebounds, while dishing out six assists. The 5-foot-3 junior did all of this despite collecting a couple of early fouls and going to the bench.“Martha, she pursues the basketball, so to be able to get that many rebounds is not a surprise for us,” said Indianapolis coach Kristin Drabyn, whose team improved to 3-0. Anderson had 21 points and 14 rebounds. Mishler said the Greyhounds’ pair made things tough on TU. Tiffin kept the game close into the third quarter. A basket by newcomer Khala Downing brought the Dragons within 44-38 with 2:02 left in the period, but a jumper by Claire Carlton and a 3 by Sarah Costello pushed Indianapolis’ lead to 49-38 just before the end of the third quarter. Even though TU’s Deidre McKay connected on a shot at the buzzer to make it 49-40 heading to the fourth, the Greyhounds had control of the game. They outscored Tiffin 18-15 in the final period to secure the win. Also key was a huge rebounding advantage, as the Greyhounds outboarded the Dragons, 42-22.Tiffin was led on offense by Downing, who came off the bench for 12 points, and by McKay, who had 11. Allie Miller had six points and a team-high seven rebounds for the Dragons.